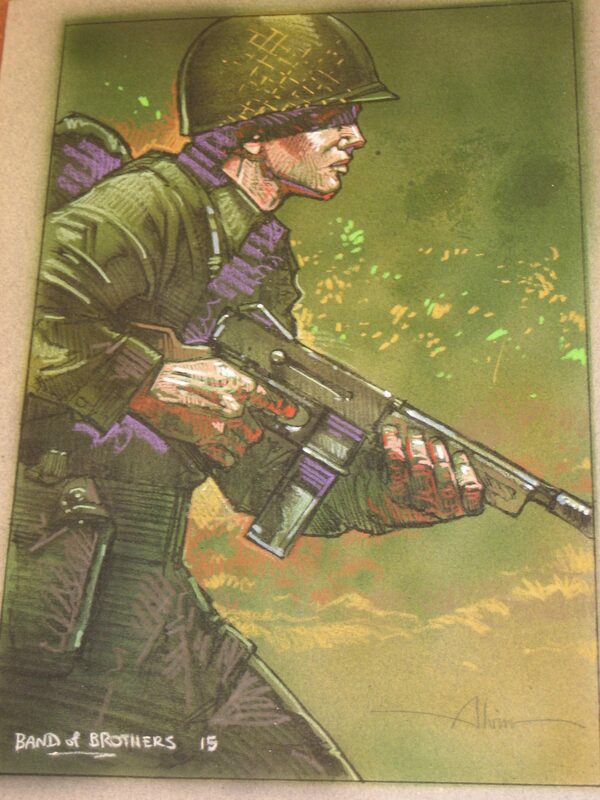 John Alvin did art for the campaign to promote the wonderful, timeless HBO mini-series Band of Brothers, which won 6 Emmys. I thought on the anniversary of the attack on Pearl Harbor, I’d examine the story behind John Alvin creating Band of Brothers campaign art and find out more about the process, and the general fascination with World War II history I recall John having and discussing with me on a regular basis. I remember John Alvin and I talking many times about World War II. He never mentioned his personal history, or how he was connected to it. I told him some of the stories about my family, which he found very compelling. My grandmother Colette had been working in London when France fell and Charles de Gaulle made his speech about the importance of everyone doing what they could do in the war effort. She was working directly under Rene Pleven, as part of de Gaulle’s Free French Forces. She went to de Gaulle and asked him how she could help, and he told her he needed her in New York. She had grown up in New York, spoke both French and English, and knew many important people in the US who could help, so he sent her there to organize relief for the Free French. My dad, who was only 5 or 6 at the time, had to come from Paris to Vichy, France, to North Africa and onward to New York to reunite with her while she was doing her work for de Gaulle. My dad told me during that time he saw a man get kicked down a long flight of stairs in the subway by a German officer, cracking his head open. He remembers it vividly to this day. He doesn’t remember Pearl Harbor, because in France, they were already deeply into the war. John was fascinated. He never told me his story himself. When he spoke to me, it was about that book and that series, and how great he thought it was. I, too, fell under its spell, especially as so many great actors took part. I’d been a fan of Tom Hanks since Mazes and Monsters. His second collaboration with Steven Spielberg, the Emmy Award-winning miniseries was about “Easy” Company, a parachute infantry regiment. It made Damien Lewis famous in the US, (a gift that keeps on giving..) and was at the time the most expensive TV miniseries ever made by a network. The first episode premiered on September 9th, 2001, two days before the September 11th attack. I just spoke to Andrea Alvin about why she thought he was so connected to his work on Band of Brothers. As you’ll see, John Alvin’s connection to the subject ran deep. His father, Albert Alvin, had been a career military man. He was a captain in the Army, and spent World War II as a military intelligence officer stationed in Italy, because he spoke fluent Italian. His mother Rena had been an Army nurse and followed Patton’s troops. She was at the Battle of the Bulge, where she worked right behind the front lines caring for the injured from all forces; American, German…anyone who needed urgent medical intervention. The battle lasted from December 16th, 1944 to January 25th, 1945. For the rest of her life, she would get weepy every year around Christmas remembering the horrors of that traumatic experience. Also, as a young child, John Alvin lived for about four years in Germany. His father was part of the occupational army helping rebuild Germany*. When John was 4 or 5, his dad took him to an abandoned Messerschmitt factory. It was like a graveyard of airplanes. He was allowed to climb on and in the planes. It made a huge impression on him, and Andrea counts that experience as one of the main reasons he was so obsessed with building models. 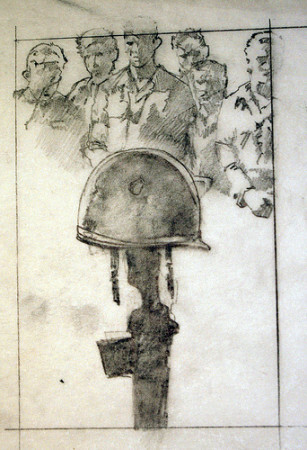 The art John Alvin created for the Band of Brothers campaign, though not ultimately used, has an emotional quality and visual authenticity derived from his love of history, interest in research, and his personal connection to that time. The color images look like they are done in pastel, but John never worked in pastel. 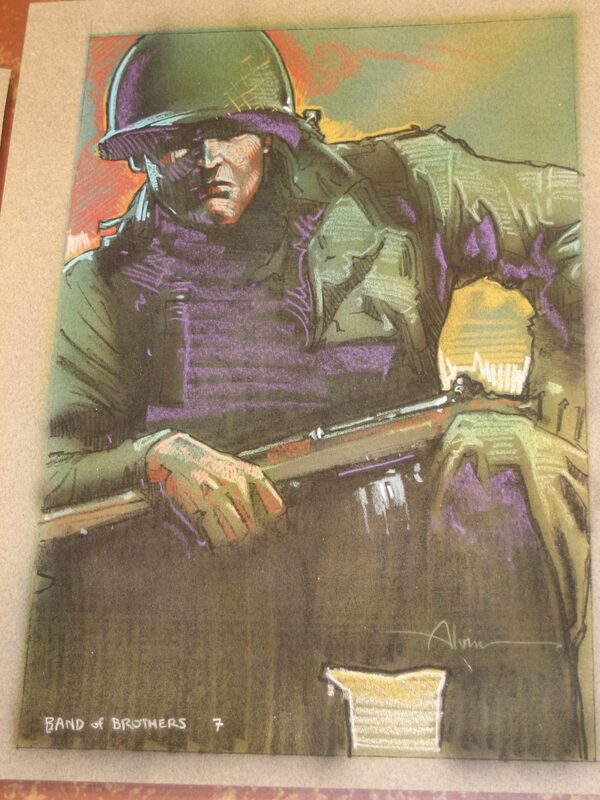 He worked on pastel paper, and used Prisma color pencils and freehand airbrush to get the effect of pastels. Though not sure, Andrea thinks John may have also used some actual pictures of his father as reference. Whatever his inspiration, he captured the bravery, and the intensity of focus and commitment the men of Easy Company must have maintained as they struggled through the terrifying experience of surviving war. On the anniversary of the attack on Pearl Harbor, we think of all those men and women who gave their lives or lost their optimism and their innocence, and who fought bravely to keep this country safe. We also remember that standing up for those being endangered around the world, as well as on our own shores, is the true mark of patriotism. 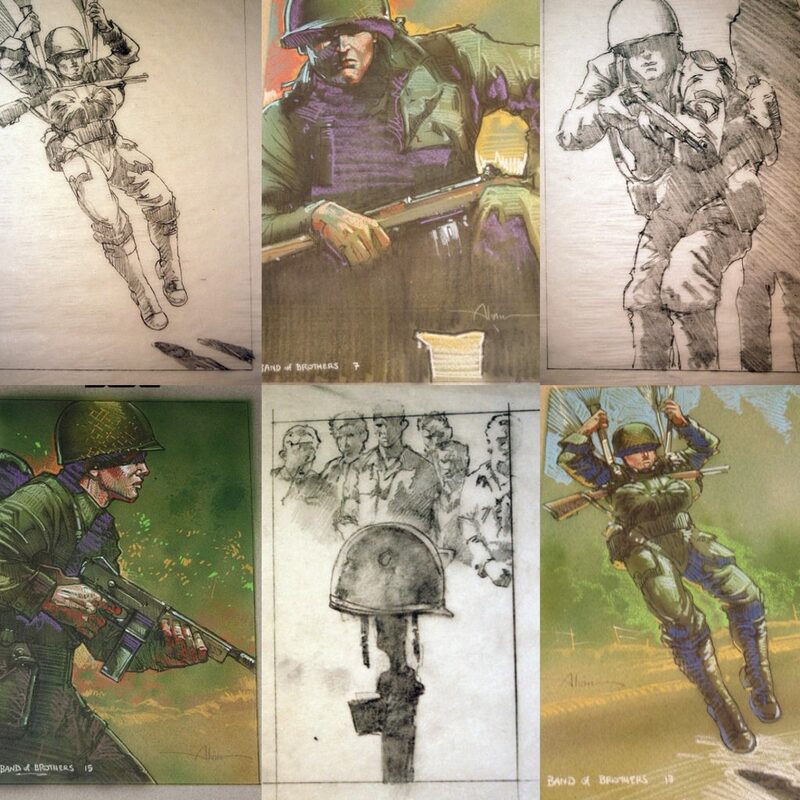 If you’re interested in any of these great images, click here for the John Alvin Band of Brothers art page. *years later, John would find out that the entire time he lived in Germany, they had a bodyguard who followed them everywhere.